Artful Elegance - Was $155, Now $100! Do you have an anniversary coming up? A birthday for a unique individual? Here is a promotion you won't want to miss on a Cactus Flower Exclusive arrangement: This striking gift is specially priced at $100 (originally $155) for a limited time. 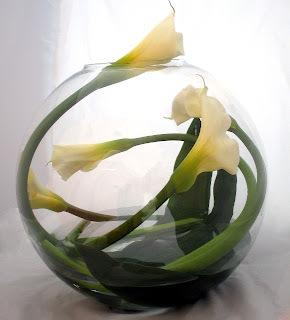 Five long-lasting, large white calla lilies are artfully arranged within the bowl. The bowl stands 16" tall and makes for a dramatic presentation. The retail value of the bowl itself is $90, and will treasured as a lifetime keepsake. 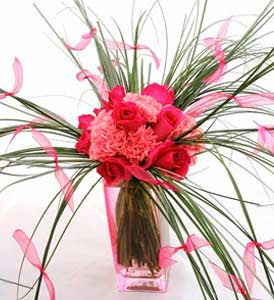 This product is exclusive to Cactus Flower and can only be delivered within the Phoenix metro area. For more details, click here. October is National Breast Cancer Awareness Month. According to the American Cancer Society, about 178,480 women in the United States will be diagnosed with breast cancer this year. The mission of Breast Cancer Awareness Month is to increase knowledge of breast cancer issues, particularly regarding early detection. Cactus Flower is pleased to announce a partnership with Making Strides against Breast Cancer, a national walk that supports the American Cancer Society¹s research and support programs for breast cancer patients and their families. For the month of October, Cactus Flower will donate 20% of the sales of the Tribute to Toshiko arrangement to Making Strides against Breast Cancer. About the Tribute to Toshiko arrangement: Toshiko Sasaki has been a designer at Cactus Flower¹s north Scottsdale location for 6 ½ years. In March of this year, she was diagnosed with breast cancer. While she was receiving treatment, Toshiko inspired us by her positive attitude and her dedication to her job as a floral designer. Toshiko says she continued working through treatment because she loves the work and especially loves the people. Toshiko¹s warm smile has never left her face because she has peace in her heart despite her diagnosis. On September 25th, we celebrated her birthday AND her last chemo treatment. This arrangement was designed by design manager Tonia Miller in honor of Toshiko. To learn more about the Making Strides against Breast Cancer event in Phoenix on 11/17, click here. For information and resources on breast cancer, click here.